The earliest people probably evolved from other primates around a million years ago. That may have happened in or near what is now Sudan, south of Egypt. At first all people were hunters and gatherers. But by around 4000 BC, Nubians domesticated millet and sorghum and were farming. In Aksum (now Ethiopia and Eretria) they had domesticated another kind of grain called teff. Around the same time, Nubians domesticated donkeys. They also began to herd cattle they got from further north, and to eat dates from the Arabian peninsula. By this time, they were building mud-brick palaces for their kings, studying astronomy, and using irrigation to manage water. Nubians traded with Egypt from early in the Bronze Age. As early as 3000 BC, there was already trade from Nubia, south of Egypt, all along the Nile river to the Mediterranean Sea. The Nubians taught Egyptians to farm millet, and they sold them donkeys. They sold gold to the Egyptians. They also sold ivory, furs, and exotic live animals like elephants and lions. And they sold people as slaves. Nubians also sold diorite, a hard black stone, and granite, for Egyptian statues, and jewelry stones like carnelian and agate. In return, the Nubians bought Egyptian cotton and linen cloth, glass, jewelry, perfume, and wine. Nubians also often used their profits to hire Egyptian architects and engineers, accountants and priests, to work on Nubian projects. About 1500 BC, the Egyptian pharaoh Hatshepsut was trading for gold, ivory, and furs with Ati, the Queen of Punt. But by this time, there were also wars between Nubia and Egypt. The Egyptian pharaoh Tutmosis I invaded Nubia, and took over the kingdom of Kush as far as the fifth cataract of the Nile in 1580 BC. Egypt pretty much dominated Nubia for the next five hundred years or so, and what was left of Nubian power moved further south, to the kingdom of Meroe. But after the collapse of the New Kingdom – about 1000 BC – the Kushite kingdom began to get stronger again, and by 748 BC, the Kushites attacked and conquered Egypt (as the 25th Dynasty). In 664 BC, the Assyrians conquered Egypt. The Kushites learned how to make iron from the Assyrians, and they used their iron to become even more powerful than they were before. After 150 years, in 591 BC, the Egyptians under Pharaoh Psammeticus II were able to throw out the Kushites and reconquer Nubia. When Egypt came under Persian control about 500 BC, Kush and Meroe also came under Persian influence. By 350 BC, however, Meroe was getting poorer. This is probably because there was more and more trade by way of the Red Sea. Meroe, along the Nile, did not benefit from this, but the neighboring kingdom of Aksum did. Queen Shanakdakhete probably ruled Meroe about 160 BC, the first of a series of women who ruled in East Africa. After the Romans conquered Egypt in 30 BC, the Kushites tried invading Egypt again, but the Roman army sent soldiers to fight the Kushites off in 24 BC and they ended up signing a peace treaty. 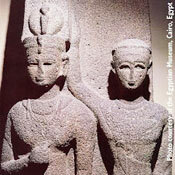 The Romans from then on traded along the Red Sea directly with Kush and Aksum, instead of always going through Egypt. Generally power in Nubia moved further south, and along the Red Sea rather than the Nile. But women continued to rule – between 0 and 100 AD, there were a series of women rulers in Meroe known as the Candaces. Amanishakhete, perhaps the first of these rulers, fought off a Roman army sent by Augustus in about 10 BC. Starting in the 300s AD, the people of Nubia converted to Christianity, following the lead of the Egyptians and the Roman traders. Around the same time, the introduction of the water wheel for irrigation helped Nubia produce much more wheat, barley, and millet than before, as well as wine grapes and dates. Despite the Islamic invasion of Egypt and the establishment of the Fatimid dynasty there in the late 600s AD, Nubia stayed Christian. In 641, the Fatimids made a treaty with Nubia that allowed Nubians to cross Egypt to get to Jerusalem on pilgrimages. The treaty set up a trade where the Nubians sold slaves to Egypt and bought wheat, wine, and cloth. The countries kept up this treaty for more than five hundred years. Meanwhile, the Eastern Roman Empire worked hard to keep up a relationship with Aksum, to keep the Abbasids and Fatimids from totally controlling African trade. In Aksum, the kings and bishops spoke Greek, and some people wore Byzantine clothing. Aksumite traders sold ivory to Roman traders, and bought Byzantine jewelry and glass. Architects cut many Christian churches into the local sandstone, and artists painted the churches with religious scenes. But by the 1200s AD, with the collapse of the Fatimids in Egypt, and the weakening of the Eastern Roman Empire, Aksum also weakened. Arab nomad tribes invaded over and over. 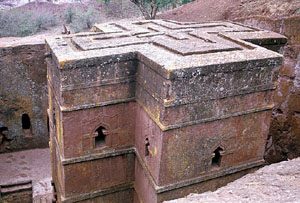 Finally, just after 1300 AD, Aksum got its first Islamic king, and the many churches were all turned into mosques. Cite this page: Carr, K.E. Ancient Meroe and Aksum – Early Sudan. Quatr.us Study Guides, May 18, 2017. Web. April 23, 2019.